There is something about a shiny white smile that just seems healthy, but our teeth take a lot of punishment over the years with the food that we eat, and the liquids that we drink. 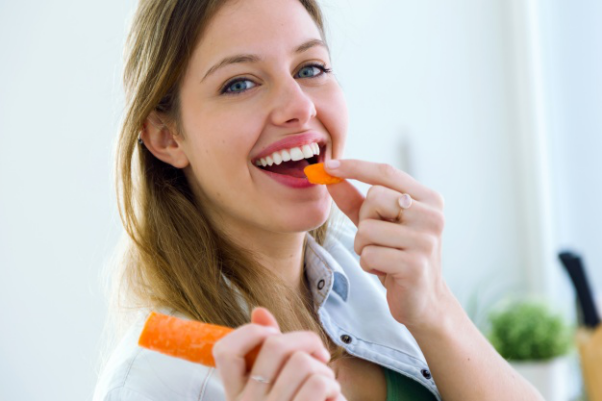 There are some foods which can help maintain healthy white teeth but there are also a lot of things that you should not overindulge in if you want to keep your teeth looking beautiful and white. If you like ketchup on your burgers, then the sauce does a lot of damage to your teeth. If you want to avoid dull looking teeth, then you should consider not adding this sweet tomato sauce to your food. Sweet drinks including carbonated drinks are not only bad for the waistline, but also for our teeth. These drinks often have a high sugar content which is already bad enough for the teeth, but the acidity of the drinks is also not good if you want your teeth to remain sparkling white. If you have undergone teeth whitening in Sydney, or anywhere else, but just cannot resist your sweet and sugary drinks, then drink them through a straw so that the liquid goes past your teeth. Drinking white wine can also stain our teeth, so if you enjoy a glass of wine on occasion but want to keep that winning smile, try switching to another tipple. Avoid drinking spirits with soft drinks and fruit juices, as the acidity and sugar are just as bad for your teeth. Our daily dose of caffeine is something that a lot of us think we cannot do without, but if you want to avoid staining and discolouration of your teeth, it is something that is best avoided. Our cups of coffee and tea, and even fruit tea, can have a significant impact on the colour of our teeth and abstain from drinking them and using advanced whitening toothpaste for a month could show you some remarkable changes in the colour of your teeth. Smoking is also something which stains not only the fingers and smells bad but also can stain your teeth. If you want to keep your teeth white, then you should give up the habit which will also have many added benefits to your health, and also your wallet. The heavy spices that are used in Indian cooking smell and taste amazing, however, they do also stain your teeth. To keep them looking pristine and white, next time you are thinking of a takeaway choose something that will not discolour your pearly whites. Anything acidic will be bad for your teeth, and these are two things that will change your smile from dazzling white, to dull and dirty. As much as they are tasty, the berries that we eat also can stain our teeth, as well as our hands and face when we eat them. You do not have to avoid any of these foods entirely to keep your teeth shiny and white, but you should make sure that you only consume them in moderation. Clean your teeth thoroughly after eating or drinking, and you can help to keep your smile beautifully white for many years to come.